When Chalk Paint Won’t Work, Try Gesso! I found a cute vintage style frame for 99¢ at a thrift store, and really liked those raised details! I wanted to bring them out with farmhouse highlights. I’m actually working with 2 frames in this post, so keep reading to the end. The plan was to paint it first with black, then follow with white and distress so the black would show through…my project for the Monthly Thrift Store Upcycle Challenge. I’m always looking for an easier way to get the look I love, rather than always chalk paint and dark wax, which I don’t like working with. 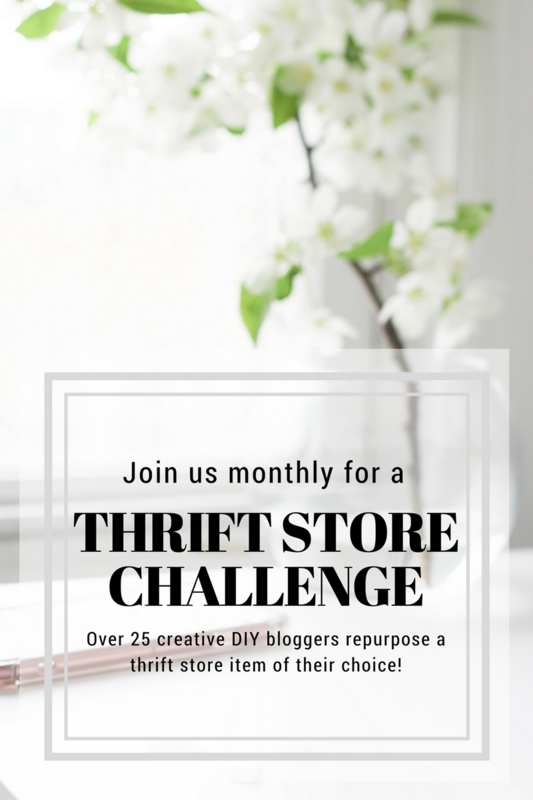 We bloggers challenge each other to create something from a thrift store find. It can be anything! We can spend any amount to create our own respective masterpieces. Other than the cost of the 2 frames ($2.98), I had everything else on hand. My usual method is to sand a bit first to minimize any glossiness, but I discovered the frame wasn’t wood, but possibly resin. After applying 2 coats of black spray paint, it didn’t seem to be sticking very well. I was positive I let it dry long enough. Yes, that sucker dried for 2 whole days, but when I barely touched it, the paint peeled right off. UGH! I felt like tossing it in the trash, but I don’t give up so easily. Well really, I think it’s because I spent money on it, so it’s not going in the trash! I sanded a bit to see if any more paint would come off. I didn’t want more layers lifting off with whatever I might put on top of it. I’m not sure why it wouldn’t stick. After all, chalk paint sticks to everything right? Since I had just been reading about Gesso, I decided to give it a try. I already had it on hand from another project I’d done some time ago, but it landed in the back of all my paints and I forgot about it. I was ready to experiment with it again. If you haven’t tried Gesso before, it comes in white, black, and gray, in various size bottles, and is found in the artist’s paint section of craft stores. Artists use it to prime their canvases, but it can also be used as paint or as a paint supplement. You can water it down and use as a wash, or use it full strength from the bottle. You can mix it with paint, as I decided to do here. No rocket science, I just poured a little Gesso into a plastic pudding cup I was using…maybe a tablespoon, then added another tablespoon of white chalk paint. I’m estimating…I truly didn’t measure anything. Then I applied it to the frame with a narrow bristle brush. I was hoping it would stick, but I was prepared for the worst. Success! I don’t have a photo of it dressed in white, but it worked. What I totally love is how the beautiful highlighting effects on the details were achieved! I found a product giving these wonderful effects…Dixie Bell Grunge Glaze. I’m not being paid to say it either…I just like the product. I like it much better than using Annie Sloan’s Dark Wax because my fingers don’t come in contact with the material at all, and I don’t get that sticky, messy feel. A little goes a long way too. If you decide to try it, don’t be taken aback by the color when you open the jar. It looks light gray like this. But it dries a delicious dark brown…just the way I like it! Here’s the second $1.99 thrift store frame I experimented with, and it looks pretty good on its own, I admit, but I wanted a different look. No hanger on the back, so it could be a tray. I alternated my Gesso/paint mix with Grunge Glaze in several layers, and used a light layer of Annie Sloan Duck Egg in between. I’m trying to decide if I want to highlight with Rub n Buff gold. I’m hesitating because if I don’t like it, I’ll have to start over. I could fake it and say I’m crazy about the second look. I’m not. I think it’s missing something. I’ll continue to experiment as time goes on, but I love look #1! I hope I’ve encouraged you to experiment with Gesso and Dixie Belle’s Grunge Glaze. It’s a nice alternative to dark wax. On one of my thrifting jaunts out of town, I found a dated, junky-looking wall shelf. Darn it! Wish I’d taken a before photo. With a long gash on its side, no paint, and a dated 80’s strawberries inset on the top, it was barely worth a second look. But I wasn’t finding anything else that day, so I decided to chance it. I got this old, but new project done just in time for the Thrift Store Upcycle Challenge where a group of us bloggers re-creates a thrift store find. The first thing I did was lose those awful strawberries! Then I painted it with Annie Sloan’s “Cream,” which is a soft yellow. But what to do with the inset? I was stumped. I couldn’t decide. It wasn’t very big, but it was about 1/4″ deep. I finally decided to go with tile. I had done another small tile job that turned out pretty well. I had a lot of pink, green, and turquoise tile bits, but not much that went with yellow. I told myself it wouldn’t matter once the grout was in, and glued my tile bits down with Mastic. I set it aside till I had time to go on a tile hunt to do a larger job I was planning. And there it sat for the next 3 years becoming increasingly buried under junk! Every time it caught my eye, I was a bit discouraged by it. Reckoning day came. I’m having a big purge and yard sale this Spring, so it was time to decide what to do about this wall shelf! Finally! My goal in re-doing the shelf in the first place was to sell it in my Etsy shop, so it had to look good. I filled the space with Spackle, which is what I should have done in the first place. After repainting, I decided to decorate the filled space with a decorative mold. I thought about an image transfer, but I really wanted to experiment with the molds I already had. Here is the beautiful sheet of “Iron Orchid Designs” molds I purchased on Amazon. I should have made a before shot. Here they are covered with powder. You can use Corn Starch or baby powder for coating, which makes it easier to extract your molds. I guess you’re wondering about the arrows. I’m pointing out the really thin parts of the mold that would be impossible to cut out without breaking. I didn’t think about that before I bought these! All I saw was how pretty they were. I attempted to use the one in the middle several times, but courage failed me because I just couldn’t see myself trying to cut it out! After I was all done with the larger flower design to the left, then I examined the picture on the front showing that the molds weren’t cut out that close to the design anyway. Next time I’ll know better. There are basically 2 types of clay…the air dry types, and those you bake in the oven. I have both. I started out with the bake kind…. This was the first attempt, and though burned, I was excited that they didn’t break which I learned was a common problem. I wasn’t planning on eating them…I was going to paint them anyway. However, they didn’t lie completely flat, and one of the videos I watched said, “don’t be surprised if E-6000 won’t work to glue them down”…a disappointment. E-6000 is my serious go-to glue. For the above reasons, I decided to go with the air dry kind. Unfortunately it only came in one amount…huge! This humongous brick cost $10.99. I’m going to have to do a lot of mold jobs to use that up! You can definitely glue it with E-6000 after it dries a little. Here’s the Air Dry clay flower medallion glued down…now we’re talking! I liked this much better! The air dry clay seems to give the mold more definition, and there’s no problem with lying flat. The next step will be touching up the shelf, painting and waxing the medallion after it dries a bit more. Here is the medallion painted….next I’ll add some highlights. I achieved this look with a mix of brown paint and black glaze I had on hand. When that dried, I applied a layer of white Gesso, then a layer of dark wax. So here’s the thrift store junky wall shelf restored! Trust me, it’s a whole lot better than the strawberries! Keep reading to see the awesome projects below!